On the night of October 10, 2008, Johnny Altinger, 38 and single, was heading to his first date with a woman he had met online. Soon after, Johnny’s friends received strange emails and computer messages from him, boasting of his new girlfriend and her plans to treat him to an extended tropical holiday. Two weeks earlier, aspiring filmmaker Mark Twitchell, a young father with a devotion to the television series Dexter, began a three-day shoot for his latest short film. His horror story featured a serial killer who impersonates women on an online dating site to lure unsuspecting men to his suburban kill room. But was his script actually the blueprint for a real-life murder? And what of Twitchell’s other writings, including the elaborate and shocking document titled S. K. Confessions? Was it a diary detailing his dark transformation into a would-be serial killer? 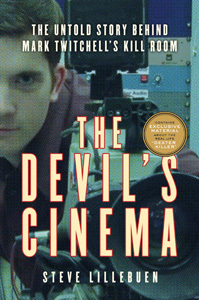 Combining sharp journalistic insight, years of meticulous research, and a powerfully gripping narrative, The Devil’s Cinema is the definitive account of the notorious “Dexter Killer,” a case and trial that captured the world’s attention. Author Steve Lillebuen takes us deep into the extraordinary police investigation and the lives of everyone involved, while unveiling never-before-revealed details, all drawn from extensive and exclusive interviews — including a year of contact with the killer himself. Moving from the police station to the courtroom, from the surface calm of suburbia to the surreal glamour of Hollywood, The Devil’s Cinema is a compelling, multi-faceted story of dangerous obsessions pushed to extremes.